Walt Disney World Resort offers an amazing range of dining experiences to suit the whole family – even fussy eaters will find something they love. As well as dining venues at all of the amazing Disney theme parks and hotels, you’ll find tasty treats at the restaurants of Downtown Disney and Disney’s BoardWalk. There are quick service options, fine dining restaurants and everything in between. Quick Service meals are counter- or self-service, perfect for casual eating or to fuel up for your fun in the parks. There’s an enormous selection of quick service meals across Walt Disney World Resort serving up everything from pizza, burgers, pasta, sandwiches, barbeque and so much more. Waiter Service meal offer you a sit-down experience in a restaurant with a more relaxed and leisurely setting – friendly waiting staff will take your order. There’s an extensive range of worldwide cuisines including American, Chinese, Mexican, Moroccan and even classic British favourites. The Disney Dining Plans also offer plenty of options for when you just need a little something to keep you going for the day. Snacks are available at any Quick Service restaurants as well as snack carts across the reasort. *Applies to self/counter service dining. 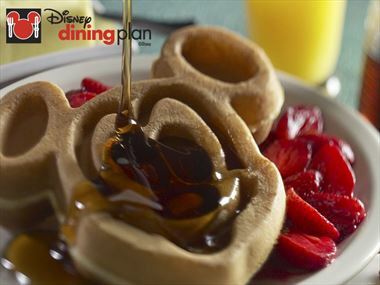 Disney Dining Plan definitions: Quick Service meal includes a choice of one main course, one dessert and one single-serving non-alcoholic beverage; OR one complete combo meal and one single-serving non-alcoholic beverage. Waiter (Table) Service meal includes a choice of one main course, one dessert and one single-serving non-alcoholic beverage; OR one full buffet and one single-serving non-alcoholic beverage. Snack is a choice of ONE of the following: medium fountain soft drink, one 20oz bottle of soft drink or water, one popcorn scoop (single serving box), single serving bag of snacks, 12oz coffee, hot chocolate or hot tea, single serving pre-packaged milk or juice, one frozen ice cream novelty or piece of fruit at selected locations. Refillable Resort Mug entitles the guest to unlimited refills of fountain soda from the Quick Service Restaurant in the Resort Hotel where the guest is staying. Mugs are not eligible for refills in Theme Park, Water Park or Downtown Disney locations. 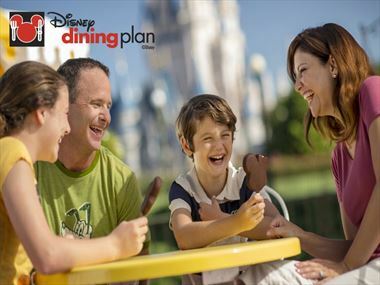 A Disney Dining Plan must be selected for all members of the party travelling who are aged 3 or over at time of travel and for the full duration of their stay. Children aged 3–9 (at time of visit) must order from the children’s menu where available. Disney Dining Plans are not valid for children under 3 years. Participating restaurants are subject to change. A mandatory ticket purchase is required for all dining plans and Dining Plans are available on single centre holidays only.